Mental Logs is a well known routine. But it generally remained a math puzzle and never got to become a mind blowing miracle, at least for many performers. 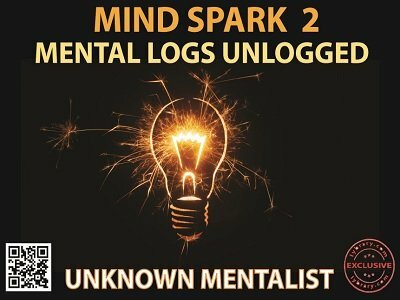 Mental Logs Unlogged, although based on the basic principle of mental logs, has been treated with a double dose of steroids and zooms up very high in terms of impact and impossibility. First, you do not need to carry your mental logs anymore. Second, the theme here gives you a plausible reason to use sets of 4 digit numbers. Third, a few business cards is all you need to perform these amazing routines. Fourth, the basic principle has been significantly improved here to add many layers of deception and a few cool subtleties and yet remains extremely easy to learn and perform. Fifth and finally, even though the participants lie 95% of the time, the performer is able read their minds accurately - and repeat the process too, if needed. You can even perform these routines blindfolded. No peeks, no switches, no impressions, no center tears. No sleights, no preshow, no stooges, no instant stooges. No dual reality, no multiple outs, no electronics. Nothing to reset. Instantly repeatable with a different outcome. Suitable for close up, street, parlor or stage. Extremely easy to present by the performer and also extremely easy for the helper to participate in. If presented well, this can truly fry your audience. 1st edition 2017, 13 pages.